Significantly reduced in price. 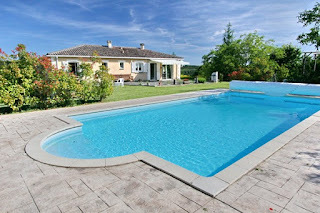 Located in a listed hamlet close to St Germain de Belvès and within a 5 minute drive to an 18 hole golf course, this old stone property has been recently restored and extended to provide very comfortable accommodation. 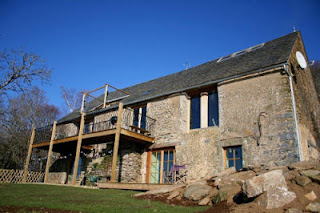 Set on a hillside with lovely views, the property benefits from a wealth of exposed stonework and beams and the owners have retained many original features. Outside the fully fenced pool with its own pool house and additional shower room enjoys a sunny disposition throughout the day. 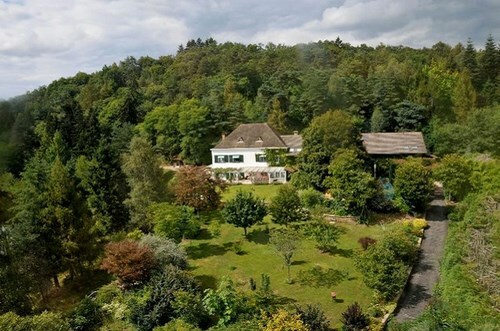 A lovely Domaine, for those who crave privacy and tranquility. 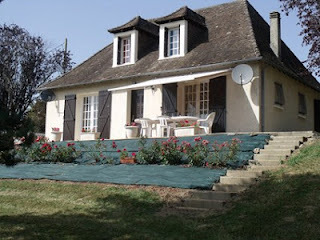 The main house has 3 bathrooms (1 with sauna), a living room with a fire place, and a spacious terrace facing south. It is in good condition (recent new roof & heating systems). In addition there is a small apartment (2 bedroom with bathroom and kitchen) and a holiday apartment each having separate entrances. Just 50 meters from the main house there is a chalet with a place for bathing with a man made white sand beach. The largest lake also has a Canadian log cabin, and this is perfect as a fisherman’s retreat. There is also a small pontoon and a man made beach here. The lakes are spring fed, and offer very high water quality, excellent fishing and there are even freshwater crayfish. Waterfalls create a lovely atmosphere within the park, and offer the prospect of generating hydro power. Some of the water gardens have natural fountains, (provided by the pressure from the higher lake). 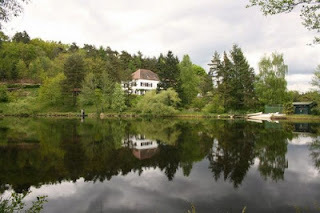 Situated on a 22 ha (220,000 m²) plot of land, the land is roughly divided into forest/woodland (35%), grass land/grazing (30%), three lakes of around 4.5 ha in total (20%) on three different levels and the area close to the house (15%). Fishing and / or hunting on your own property is possible given the scope of the land. 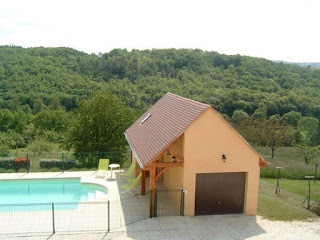 Beaulieu sur Dordogne - for sale - Barn conversion with independent apartment, infinity pool and stunning views. 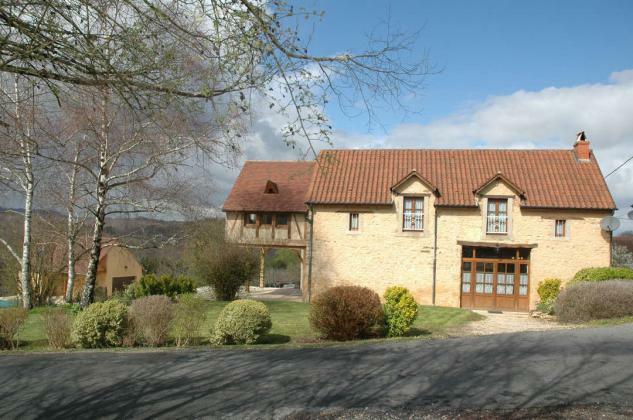 This wonderful property has the feeling of the “Grand Designs” TV programme, giving all the advantages of a new build within a traditional setting. Offering around 300m² living space. Built in 1906 and converted in 2006, including a new roof. Grounds of 6,000m², including a garden with small pond and rockery. Infinity swimming pool (10 x 4m) surrounded by 60m² hardwood decking, large parking area, and planning permission for 6 x 8m garage. Located near Beaulieu-sur-Dordogne one of the most beautiful towns in Southern Corrèze (known as the Corrèze Riviera), there are magnificent uninterrupted views across the valley onto Puy D’Arnac, Curemonte and Turenne and into the Lot. Both of these outstanding properties have just been reduced by their owners to a very competitive price of 299,250 € inclusive of agency fees. The 1st house was built just 10 years ago, comprises an entrance hall with a large lounge/dining room (41 m2) with 3 large double glazed sliding doors each with electric shutters and looking over lovely views, a fully fitted kitchen with dishwasher and built in cupboards (13.90 m2) with a walk-in pantry (2.74 m2), 3 bedrooms (12.3 m2, 11.5 m2 and 11.4 m2) all with parquet flooring and fitted wardrobes, a separate WC (1.2 m2), a bathroom (7m2) with WC, bath, shower, wash-hand basin with water softner system. Normal sous sol basement arrangement. Only 15 minutes from Perigueux, the capital of the Dordogne, yet it is set in a lovely quiet country setting so you get the best of both worlds. 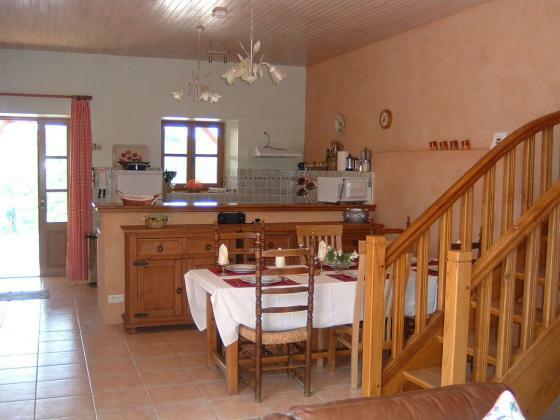 Excellent property for those wishing to live near and/or work in the capital of the Dordogne. The 2nd house has that special factor - Location, location, location. It overlooks a market town with its gothic church and chateau. The panoramic view of the surrounding countryside is just breathtaking. Ground floor: Entrance with storage cupboards, dining room/lounge with insert, fully fitted kitchen, large bedroom with built in wardrobe, bathroom with bath, shower and wash hand basin and separate WC. Upstairs: 3 bedrooms, a bathroom with shower, bidet and wash hand basin and a separate WC. 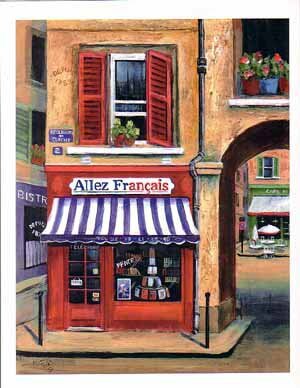 French property prices about to rise ? Since 2007, property prices in rural France have drifted slowly downwards. Fuelled at the start of the Millenium by British buyers, prices had increased significantly helped the expansion of low cost airlines and refurbished French regional airports. When the Global financial crisis struck, it hit hard. Sterling fell from around 1.50 €, to below 1.10 and near parity, causing significant problems to British ex-Pats who had moved to France during this golden period, and often on fixed incomes (pensions). Their standard of living was litterally slashed by 35%. Inevitably, property was seen as overvalued, and the number of sellers started to exceed the number of active buyers. In that sort of market, only one thing happens. People started to look for safe havens, tradionally bank deposits and gold. But the last few months has seen a shift of sentiment in all of these areas, and markets are driven by sentiment. Today, investors are nervous about holding too much cash in the bank. the returns are almost non-existent, Greece has been a wake up call to what could happen. More sphisticated investors turned to Gold, and prices rocketed to record levels. Gold prices today are around $1,560 an ounce, their lowest level in about a year and down about 13% from highs around $1,800 an ounce last autumn. Add to this that it looks like we’ve only seen the beginning of the gold price declines. Investment funds have been heavily into gold, and now they are impacting upon prices via what is known as "cascading risk". This is because when a pure gold fund suffers a redemption, it has to sell gold. That results in the fund dropping further, since the underlying asset is increasingly out of favour. This in turn results in more redemptions etc. starting a vicious cycle of negativity that can be hard to break. Turning to property, since the UK Government launched its Help to Buy programme (unveiled in its March budget) and the Funding for Lending scheme (launched last summer and expanded last week) there has been a marked increase in property sales across England and Wales. Property prices in the capital rose by 0.7% in April (the highest monthly growth seen in recent years).Homes in London were typically on the market for 4.6 weeks in April (less than half the average time expected prior to the Banking Crisis). Sellers achieved more than 95 percent of their asking price. (levels not seen since 2007). Completed sales rose by 5% last year to 932,000, according to HM Revenue and Customs, (the highest level of sales since the Banking Crisis). Confidence is returning to property. Confidence is falling in other "safe" assets such as gold and cash. This is good news for the property market, not just the UK but globally. As UK vendors find the market moving again, many will advance their dream of owning a house in France. With Sterling improved at around 1.19 €, French prices low, now is a good time to be buying. There are some real bargains out there!